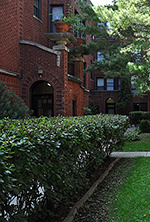 Vintage Courtyard, Bright Large Apartments, Separate Dining and Living Rooms, Hardwood Floors, Large Closets, Back Decks. Wonderful vintage courtyard. Located one block east of Clark. A short walk from public transportation, shopping, dining and entertainment. Apartments are affordable and spacious. The perfect place to call home! Shopping/entertainment/restaurants on Clark Street and Devon Ave.